On Monday The Star published an interview with Nkosazana Dlamini-Zuma. In this first interview since her return from the African Union she said that she is “her own woman” and is not simply a front for President Jacob Zuma. While it is still impossible to know who will win the ANC’s leadership election in December, it is important to consider the scenarios that could occur afterwards. We have already identified some of the problems that Deputy President Cyril Ramaphosa would face. But should Dlamini-Zuma win, it seems obvious that she will also face major problems as ANC leader. Some of them are tied to Zuma, some of them are structural, and perhaps the biggest of them is what people who lose in December would decide to do next. By STEPHEN GROOTES. In many ways, most, or even all, of the major problems that Nkosazana Dlamini-Zuma would face as a new leader of the ANC are related to the party’s current leader. It is a useful illustration of exactly how unfair politics can be that she would be painted simply as the ex-wife of the President, and that her election would be described as a continuation of his rule, a dynasty in the making. That said, the problems around the Zumas would be real and pressing, both personally for him, and politically for her. And one of the major issues is that it was his rise, and the way he has behaved (Exhibit One: the recent reshuffle) that has made factionalism one of the dominant problems in the party. As a result, Dlamini-Zuma’s first major problem would surely be the position of Cyril Ramaphosa. Would he stay on as SA Deputy President, in the way that Kgalema Motlanthe was humiliated after Mangaung? It would seem unlikely that he would accept that; he is a different kind of person to Mothlanthe, and is certainly campaigning with more fire in his belly than Motlanthe ever did (the latter’s campaign was once described memorably in the Mail & Guardian as an attempt to win a cage-fight by flower-arranging). He also appears to have strong support from people who may run on his slate, such as Secretary-General Gwede Mantashe and treasurer Zweli Mkhize. What happens to Ramaphosa would affect them all. All of these people would have strong support from members in the ANC as well. They may well believe, no matter how the election is conducted, that corruption, vote-buying or gate-keeping was responsible for their loss. This makes their reaction hard to predict. It is entirely possible that they go to court for a review. Which could take forever, with a period of real limbo for the ANC. Or Ramaphosa and his followers could simply refuse to remain in the ANC. This is where things can get very complicated indeed. This would not be a mostly one-man band driven by simple personal animosity, as Cope ended up. This would be a much bigger group of people driven by, on their version at least, a much more important principle. People like Ramaphosa, Mkhize, Mantashe, Mcebisi Jonas, Pravin Gordhan, Naledi Pandor, Derek Hanekom, Ngoako Ramatlhodi and many many more would prove to be a much formidable foe to deal with. They – let’s call them The Breakaways – would feel a real sense of mission, a sense of having to save the nation from Zuma, from corruption, from real tragedy. And they would have certain things Cope did not necessarily have. They would have far bigger numbers on their side than Cope, they would be better organisers, and considering Ramaphosa’s previous career, they are unlikely to run out of money. If they felt they could not stop what they would see as the rot from within the ANC, they may feel that they have to go outside. Of course, this is not certain, but it must surely be very likely. To put it all another way, Blade Nzimande’s injunction, “how do we know it would not be a full-scale implosion next time around” suddenly comes to mind. But for Dlamini-Zuma, there would also be another massive problem to deal with: Gauteng. It seems impossible, on the voter information publicly available, to believe that the Gauteng ANC could retain the province in 2019 with a national leader seen as an extension of Zuma’s presidency. And then there is the next big question that is not asked enough in our politics. Is the Gauteng ANC ideologically closer to the ANC of Supra Mahumepelo, David Mabuza and Ace Magashule, or to the DA of Mmusi Maimane? You can imagine the pressure that would fall on the Gauteng ANC’s leadership were all of this to occur. They have already been accused of trying to appear different to the national ANC, both in the 2014 and 2016 polls. It is simply not going to work on a third try. So then the leaders would have a choice, to tie themselves to a sinking ship, or to ditch it and try something else. Which means they would surely go along with whatever Ramaphosa or that group decides to do, or form their own alliances. Or perhaps mount a non-hostile takeover of the party. All of that could happen quite quickly after December. There would only be 18 months before the elections, during which many a professional politician would try to save his/her career. It is also important to remember some of the history of former ANC leaders. Thabo Mbeki became leader unopposed in 1997, with a coronation that meant he had the full support of all concerned. He was recalled before finishing his second presidential term. Zuma became ANC leader in 2007 after a contested campaign, but with strong support from most of the ANC. And of course, he had the literally undying support of his core constituency in KwaZulu-Natal. 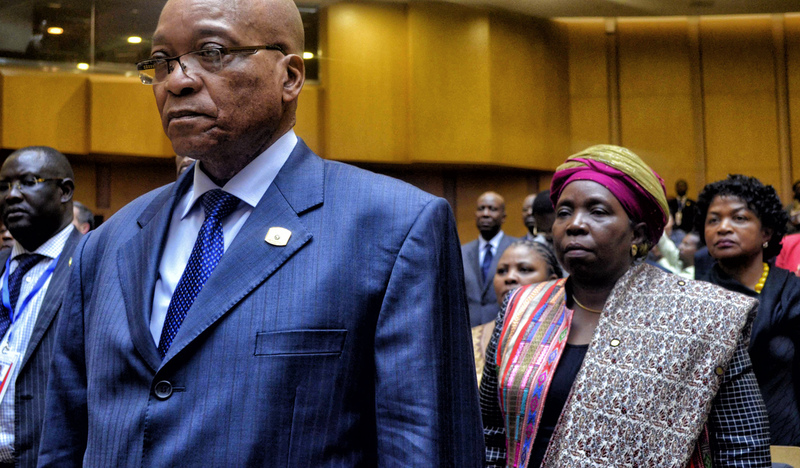 Dlamini-Zuma would be taking over as leader after a contested campaign that will have divided her party, and seen plenty of dirt being thrown around, all of it in a political environment where opposition parties are steadily gaining in strength. Even worse for her, no matter what she says or does, there will always be a powerful perception that she owes her career to her ex-husband. Unless she actually decided to allow the law to take its course and those criminal charges against him then proceeded in a court of law. Which, when you consider the evidence before us, looks rather unlikely. As if this were not enough for Dlamini-Zuma to deal with, some of the Trumpian-level promises that she appears to be making would now have to be delivered. And while it’s easy to shout “radical economic transformation” from lectures in KZN and speeches in the Free State, it’s actually much harder to put them into practice. Her first problem would not necessarily be the opposition that other parts of society would put up, but the nature of the debate within the ANC itself. The different classes represented in the party have different interests, which is why it has never been able to agree to radical economic change in the past. That hasn’t changed, and won’t change now. Which means she would face arguments on multiple policy fronts, never mind the way that an argument about, say, a wealth tax would play in the ANC’s Saxonwold branch.